3 Automated Customisation - Customise the email sent with your survey, including merge fields which are auto-populated with your class information. 3 Bulk Sending - Quickly and easily send surveys, whether it's anonymous feedback gathering, specific students/instructors from a particular class, or both. 3 Automatic Syncing - Results sync automatically with your events and you can see the sent and responded status of recipients. 3 Smart Reporting - Report on your responses, including the ability to link a response to an instructor rating generator. 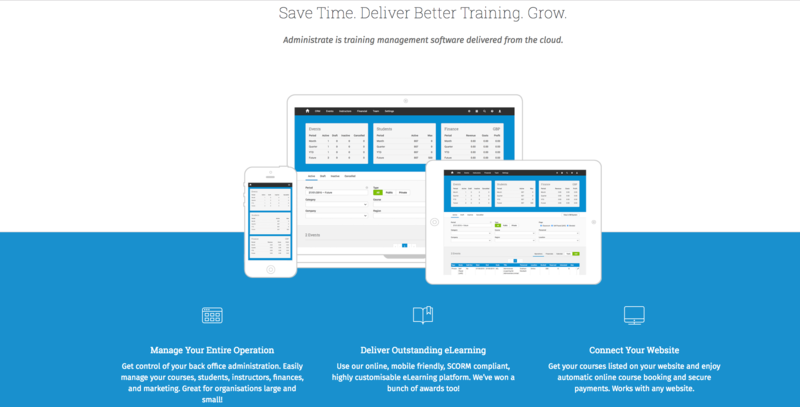 Goodbye confusing spreadsheets, hello streamlined course scheduling, resource management, CRM, reporting, marketing, eLearning, and a whole lot more. Join hundreds of customers, thousands of users, and millions of students using our platform every day. Set up a catalogue of customised, reusable courses (including ILT, eLearning, and blended learning) and schedule classes in just a few clicks. Define a path of student content, courses, and objectives and keep track of progress. Our customisable, responsive, multilingual LMS can also be set up in a click and supports SCORM, electronic files, and HD streaming video. Access CRM data throughout the system (with flexible permissions settings). Set tasks for yourself or delegate tasks to other team members, easily share and safely store documents, set up a Wiki and use our online discussion forums to keep your team up to date and see upcoming staff and instructor holidays on your dashboard. Define your budget, track your spending, and track the ROI of your marketing campaigns. Configure your sales pipeline to match how you work and the data you require at each step of your workflow. Convert wins into course bookings and create an invoice in seconds. Report on key metrics and stay in control of the bottom line. Integrate with Xero or easily export costs and invoicing data to FreeAgent, Sage, Quickbooks, or any other accounting package. Take course bookings on your website and as places sell out, your website can show how many places are left. Prospective students can sign up for courses, entering their details using the configurable four step checkout process. Accept online payments securely and safely from a wide range of integrated payment providers: Paypal, Authorize.net, WPM, Stripe and SagePay. We also have REST API, allowing you to build complex websites, workflows, or applications that interface and interact with Administrate.